Though hydroponic growing has many advantages over traditional soil-based gardening, plants are still plants no matter what method is used. This means that there are still certain optimal growing conditions which you must cultivate for your plants. Due to its controlled environment, hydroponic gardening is actually conducive to establishing these optimal growing conditions. Below are six different considerations in achieving optimal growing conditions with hydroponics. Water quality is constant concern in hydroponic growing. Depending on the area in which you live your water supply might have high alkalinity which is not healthy for plants. Typically a pH range of 5.0 to 7.0 is the goal for optimal growing conditions. All plants require sunlight to grow but the amount of direct light often depends on the type of plant. In an indoor growing environment plants require artificial lighting to supplement the sunlight. Indoors, plants require between 8 and 10 hours of direct light per day. Nutrients are plant food. Plants absolutely require macro nutrients to survive. The primary nutrients are Nitrogen (N), Phosphorus (P), and Potassium (K)- or NPK. In hydroponic gardening, additives are needed to deliver these nutrients to the roots in the form of a solution. Pre-mixed nutrient solutions are available in many varieties and can be used depending on the stage of plant growth and health. A plant’s temperature needs to be maintained at a consistent range in order to avoid sending it into shock. Vegetables which are planted during fall/winter months require a temperature range from 50 to 70 degrees. Vegetables which are planted during spring/summer months require a temperature range of 60 to 80 degrees. 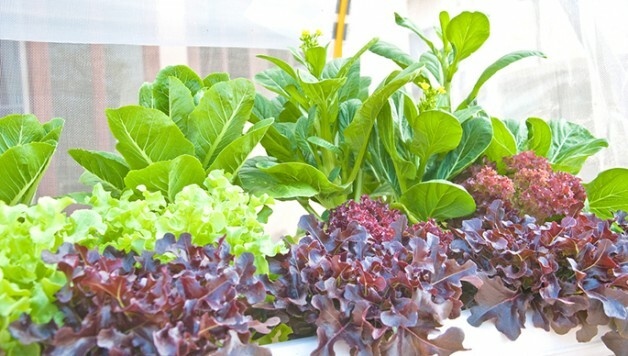 In hydroponic gardening, plants require oxygen to carry out their function of water and nutrient uptake. This differs from soil-based gardening which usually has sufficient oxygen supply. An air stone is sometimes necessary in certain hydroponic growing methods in order to circulate enough oxygen through the water supply. Without soil, hydroponically-grown plants require additional support to stay in place. By using strings or stakes you ensure that your plants’ roots are in place and are absorbing the nutrient solution effectively. This also secures them and prevents damage and breakage. Feature Image: Hydroponic gardening allows the grower to cultivate optimal growing conditions. Image via iHidroUSA.